The Research and Development arm of Hayleys Agriculture Holdings in collaboration with DJI training service provider, Guangdong Guo-An Intelligent Aviation Technology Co. Ltd. conducted a workshop on the operation and maintenance of the DJI Agras MG-1 Agriculture Drone, and carried-out a series of field trials at pre-approved locations within the Group’s Plantation Sector to assess the drone’s ariel spraying capabilities in challenging terrains and elevations. “We are pleased to see that following the pioneering leadership given by the National Agribusiness Council and Hayleys Agriculture, agribusiness companies and key stakeholders in the country are striving to improve the Agriculture sector through the introduction of digital farming and precision agriculture systems. Further to a lengthy clearance and in-house testing phase, it was exciting to actually demonstrate this novel technology in the presence of the directorate and key executives of the Department of Agriculture for the first time in the country. 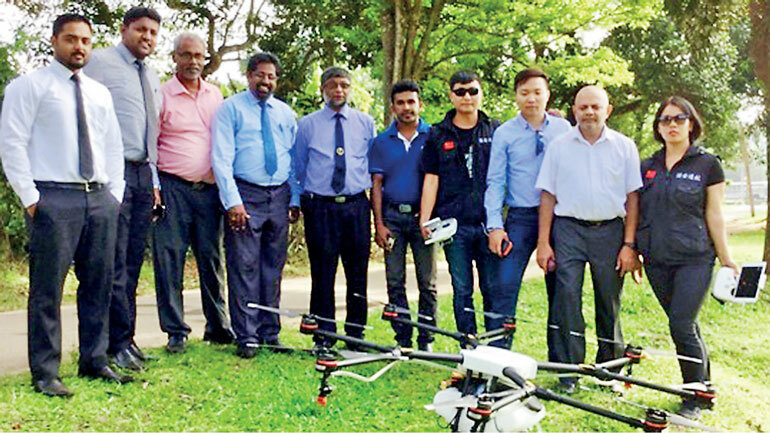 We are thankful for the relevant regulatory authorities such as the Telecommunications Regulatory Commission of Sri Lanka, Ministry of Defence, Civil Aviation Authority and the Sri Lanka Air Force for providing the guidance and framework for introduction and testing of such technology in the country,” said Managing Director Rizvi Zaheed. Dà-Jiāng Innovations Science and Technology Co Ltd. more commonly known as DJI is a world leader in unmanned aerial vehicle technology. The DJI Agras MG-1 is an octocopter designed for precision variable rate ariel applications. DJI states that the powerful propulsion system enables the MG-1 to carry up to 10kg of liquid payloads. The combination of speed and power enables that an area of 4,000-6,000 m² can be covered in just 10 minutes ie approx 40 to 60 times faster than manual spraying operations. The intelligent spraying system is able to automatically adjust the spray according to the flying speed to maintain an even coverage and ensure that the application is precisely regulated to avoid wastage and hence reduce pollution and minimise inputs to economise operations. The drone is dustproof, water-resistant and made of anti-corrosive material. Its four replaceable ceramic nozzles are each powered by separate motors and the drone can be folded for easy storage and transportation. Users can control the drone manually with a custom remote or allow it to operate autonomously. In the latter case, the drone scans the terrain below it in real-time, automatically maintaining its altitude and distance from crops. The MG-1’s most impressive feature is its intelligent memory system which enables the drone to be brought back to base to refill its tank or recharge its battery and return to its saved position to resume spraying. Hayleys Agriculture Holdings intends to fine-tune this technology to the local conditions and crop application requirements in collaboration with the Department of Agriculture and relevant research institutions. Hayleys Agriculture is also keen to initiate discussions with the relevant regulatory bodies to develop the framework for operating such technology for commercial operations. Moreover a Sensor based Crop Mapping and Analysis Drone currently under evaluation in collaboration with a US based remote sensing applications provider is expected to be revealed by next year once the field testing and necessary approval process is complete. This drone with aerial mapping and imaging capabilities is able to scout and estimate crop status, health and yields through special sensors as well as provide real-time information to optimize inputs via improved variable rate prescriptions. This drone is intended to work together with the DJI Agras MG-1 Agriculture Drone to bring new levels of efficiency and manageability to the agriculture, plantation and forestry sectors in the country.